Sassoon likes to hide and its your job to find him! He is hidden somewhere on every page.He can be quite difficult to find so I would suggest reading this book with a small group of children. Age range 5-7 year old's. This is another book which ends up battered and worn out in our library because children love it so much. The rhyming text invites the reader to find Sassoon, in some surprising intricate illustrations - I certainly have trouble finding him sometimes, but that is all part of the appeal. A great partner read with The Odd One Out that will encourage key information literacy and critical thinking skills by encouraging children to look closer, and tot decode pictures for meaning. Encourage more spoken language by reading together with you child and talking about all then other things that are happening around Sassoon. A very colourful and fun book. 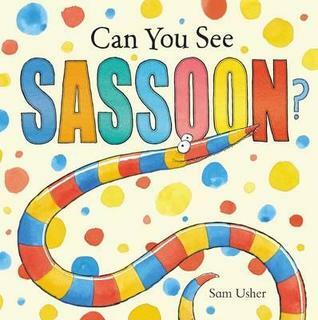 A rhyming story where children have to fin the Sassoon on every page, and 2ith the brightly coloured illustrations, this book is fun for little ones. It was good because you had to find Sassoon. I like the end when the animals shout boo!